- Adjustable white wire shelves, 3 tiers, can also be tilted. - Tempered thermopane tilt-out front glass. - Tempered thermopane glass ends, sides and doors. 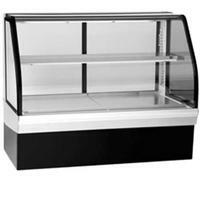 - Removable sliding rear doors, shelf lights, shelf supports, and shelves. - Top light and shelf lights. - Steel base construction, textured black powder coat finish. - Stainless steel top and sides. - Removable white display deck. - Light switch and adjustable temperature control. - UL Safety and UL Sanitation Listed. - Average case temperature of 38° to 40° F.
- Rear access to refrigeration system.